In May 2008 cyclone Nargis hit Myanmar claiming at least 138,000 lives, in contrast when hurricane Sandy hit the east coast of the United States in 2012 it claimed 72 casualties (an additional 75 casualties were claimed across the Atlantic basin). Both were massive storms, why did Myanmar suffer so many more casualties? Whether or not populations become victims of extreme events depends not only on the magnitude or frequency of natural events such as earthquakes, floods and storms, but also on a country’s vulnerability. Vulnerability includes social factors such as the quality of public infrastructure, the availability medical services and food stores, the level of education and the availability of insurance that might help to deal with economic losses. Every year the World Risk Report (WRR) features an update of the World Risk Index (WRI), which calculates the vulnerability and exposure to natural hazards of over 170 countries and then ranks them based on their disaster risk. For the last five years the pacific island nation of Vanuatu, the Polynesia state of Tonga and the Philippines have consistently ranked as the three countries with the highest disaster risk. The risk hotspots identified by the WRI tend to be in Oceania, Southeast Asia, Central America and the Southern Sahel, where vulnerability is high and people regularly face extreme weather events such as flooding, storms and drought. In addition to the index, each WRR also features a special thematic focus, where the authors of the report examine specific factors that can influence disaster risk. The 2016 report is coming out on 25 August and will focus on infrastructure and its role for disaster risk. It will also provide an updated ranking of countries with updated indicators. In anticipation of the new report, read below for key facts and figures from the last five reports. According to the Food and Agriculture Organization, worldwide, the lives of 2.5 billion people immediately depend on agriculture. The destruction of their harvests, livestock, or transportation routes by an extreme natural event threatens their lives and livelihoods. The 2015 report explored the connection between food security and disaster risk. It found that food insecurity and disaster risk reinforce each other. Disasters can devastate a country’s food stores, at the same time a country experiencing food insecurity is more at risk of disaster. For example, people are more exposed to natural hazards if a lack of food security forces them to migrate. As migrants often find themselves in riskier areas, such as steep hill slopes or slums along river banks. In the 1950s two thirds of the world’s population lived in rural areas. By 2050, this ratio will be reversed, with two thirds living in urban areas. The 2014 report focused on the influence of urbanisation on a society’s vulnerability to natural hazards. For the first time, 140 countries were also analyzed for the risk their urban populations face. Rankings were based on 21 indicators, including the share of urban population living in slums and the urban literacy rate. The report found that high and very high rates (2%-4% and >4%) of population growth in urban areas are exclusively found in developing and emerging countries. In addition, 22 of the 34 cities with a rate of population growth of over four percent are located in Africa. Overall, the report found that despite the increasing awareness of urban risks, living in cities can also reduce the vulnerability to natural hazards. The high density of cities, for instance, can make hazard response more efficient and effective than sparsely populated and poorly connected rural areas. However, rapid urbanization can also drive up vulnerability, for example, through the development of informal settlements and slums, often in areas that are particularly exposed to natural hazards such as on river banks or steep slopes (e.g. in Shanghai, Jakarta and Rio de Janeiro). The 2013 report pays special attention to health systems and their impact on disaster risk. A society’s vulnerability towards natural hazards depends considerably on its health and healthcare, but worldwide health care services are increasingly being subjected to economic pressures. This is likely to widen health inequality as it is often the most vulnerable in society who suffer most from austerity and privatization measures. For example Greece has had their health budget cut by almost half, leading to a lack of medicine and dressing material, an exodus of health specialists and increased influenza mortality. The importance of healthcare is apparent in the severe flooding in Pakistan 2010 and Germany 2012, which caused 1760 fatalities in Pakistan and 8 in Germany. The crucial factor is the lower vulnerability in Germany compared to Pakistan, which can be partially explained by a higher number of physicians per 10,000 inhabitants (Germany: 37 and Pakistan: 8), a higher number of hospital beds per 10,000 inhabitants (Germany: 83 and Pakistan: 6) and more money spent on public health care per person (Germany: 3316 USD and Pakistan: 18 USD). Well-managed ecosystems can serve as cost-effective natural infrastructure that protects people against disasters. For example, mangroves offer coastal protection from erosion, storm surges and in some cases sea level rise. The 2012 report explores how environmental destruction can make people more vulnerable to disasters. The report suggests that environmental conservation and restoration can play a significant role in disaster risk reduction. The report highlights that there are some 200 million at-risk people globally who may receive risk reduction benefits from coral reefs alone. Reefs can absorb more than 85 per cent of the wave energy which otherwise would impact coasts and provides benefits for fisheries and livelihoods. From the perspective of risk reduction, many of the most at-risk countries are tropical and coastal, which is where reefs are most abundant. People living in weak states are more likely to be the victim of a natural hazard. Failed states are typically not able to establish disaster preparedness systems. A lack of monitoring mechanisms and high levels of corruption mean that building regulations can often be skirted. At the same time there is insufficient government revenue to install early warning systems or to educate the population on disaster preparedness and risk prevention. The 2011 report focuses on the importance of good governance and the role of civil society. Chile is an example of how good governance can protect people from disasters. In 2010 Chile was hit by an 8.8 magnitude earthquake. It was the fifth strongest earthquake worldwide for over 100 years. More than three million people live within a radius of 200 km around the epicenter of the earthquake. Despite its strength and the population density in the disaster area the death toll was comparatively moderate, at 562 people. Governance played a crucial role. Chile had implemented a successful governmental anti-corruption policy. This lead to the establishment of better building regulations and improved infrastructure, as well as an efficient public sector. The government also implemented innovative disaster risk management technologies and held regular trainings on disaster risk reduction. 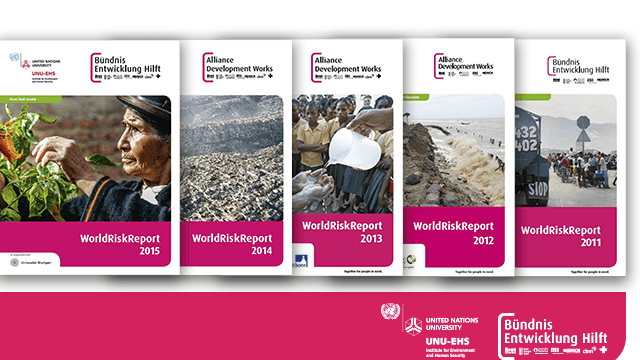 The World Risk Report is published by UNU-EHS and the Alliance Development Works/Bündnis Entwicklung Hilft (BEH) and the World Risk Index is developed by the University of Stuttgart.